With the Shamanic tools of simple and playful ceremony, you are more powerful than you can imagine. And reclaiming those tools is a huge part of this planetary shift in humanity known as the Return of the Feminine. I have been sharing these tools with my clients in every session, and every talk for over a decade now. What makes ceremony and ritual so powerful is that it accesses the subconscious part of our being that we call the Mythic, which influences our conscious mind and signal of asking and receiving our experiences in the world, as well as the actions we take to achieve our goals. Even though the deliberate engagement in ceremony with intent was largely usurped by religious institutions, and not allowed on an individual basis, it has remained in use in one form or another all around us. Other than in religious and spiritual practices, most of it takes place in business and advertising to influence us to fulfill someone else’s agenda. Now you can use these techniques in a very personal way, to fulfill your agenda of creating the experiences you would prefer in the world. It really is just a more powerful form of prayer, or positive thinking that supports those processes in a complementary way. Thus, the practice of these techniques is not counter or threatening to any belief system, psychological, or spiritual practice, or actions in the physical world towards your goals. Think of it instead as going just a little further upstream to make adjustments to your river, say by removing a log, that allows the river to flow more strongly and support your work downstream. Some more familiar modern forms of ritual include vision boards, altars, and various ceremonies from marriage to ribbon cutting, and so on. What is now returning as we claim our power and freedom and the feminine aspects of our being, is the idea that you can create your own way of engaging with the Mythic and for very specific experiences. Before I give you some examples, it is important to note that as with any thought and action, it is up to you to decide to engage from a place of love and empowerment, as opposed to fear and control. The latter use of these techniques is known as sorcery, and never accomplishes what you really desire. For example, if you try to stop a perceived enemy in the short term, it only brings more enemies and animosity towards you for the long term; whereas, if you use these techniques to empower yourself and influence the ability of this “enemy” to also thrive, the results are lasting and broadly positive. Also, since I often must address this concern with my clients, none of these shamanic ceremonies have anything to do with worshiping, nor idolatry. This is because you are not asking any being other than the Universal Source (known by a different name in every language, religion, philosophy, and science) to deliver your desired experiences. These techniques actually support the religious, spiritual, or scientific beliefs and ritual that you may already and may continue to practice. In fact, they all borrowed from shamanism and built upon these basic tools. Shamanism is just the nuts and bolts and tools that can help turbo charge whatever else you do, including just thinking of and doing stuff without the thought or belief in the non-physical at all, including atheism. So the first step before engaging with these powerful tools and techniques, is to be very clear about the overall experience you desire. For example,” I want Joe Smith to love me forever,” versus,” I want to be loved and supported unconditionally by a man who I thoroughly enjoy being around, playing with, dreaming with, and looking at.” The Universe might bring you someone 10 times better than Joe Smith in your experience, and you’ll fondly forget about old Joe pretty quickly. Unless, of course it just turns out synchronisticly that Joe Smith and his desired experiences are the perfect match for you. This is true for all the forms and mechanisms the Universe brings you to fulfill your desired experiences, from health, to work, to resources, and all of your relationships including the world at large. Check if you are dictating the specific steps and forms that you think are necessary to get the experience you want, and back away to the broader experiences as much as you can. Now you are ready to proceed with the activity itself, of which I will offer just a few examples in an endless sea of possibilities. There is usually a good order to follow, just as we do in our healing and destiny retrieval processes. The order is typically to release old blocks, patterns, and experiences that might be influencing you away from your goals. Then we sometimes have to make sure that our ancestor’s or old authority figure’s experiences and beliefs aren’t getting in the way. Then the more subtle work of making sure our own judgments and attachments don’t interfere. And the final step is anchoring the ideal goal itself. You may not need all the steps. An example for releasing the old is what we call the Sand Painting or Mandala. For this particular purpose, I also call it the Mythic Toilet. 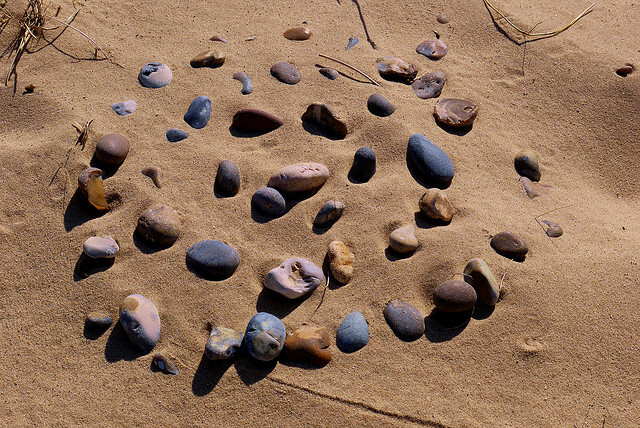 You simply create a circle of objects like stones. Then in the circle put more objects each representing the life experiences you want to let go of. You can use anything in the center, but since it is a toilet, I just use leaves, twigs, stones, cigarette butts, beer cans, whatever fodder is lying about. You can even draw it. After working with it, adding things that come up for a few days, moving things around, you can dismantle and burn or bury one piece or portion of the inside. Another approach is to just grab an object and blow the intensity of the unwanted experience into it and burn or bury that. This allows the Earth to mulch the old story for you. An example of the ancestor release is the ancestor altar. Unless you are from a culture that does a meaningful rite of passage into adulthood ceremony at age 13 or so, chances are that your ancestors are still following you around, energetically attached to you, and influencing you. Even though this ceremony releases their grip on you, you still get to keep all the good stuff they did for you, and gave or continue to give you, and typically improve your relationships with living family. The simple technique is to place on a surface a representative object or picture of your DNA and/or adoptive ancestors, or other Authority i.e. foster family, cult, or religious order like a nunnery. Then everyday for a couple of weeks bring a gift of food, drink, sweets, flowers, and so on, and drop it off at the altar. This makes a clean, loving, forgiving, respectful, and grateful break from their potentially disruptive influences on you. At it helps them to heal as well. To help you let go of judgments and attachments that can paradoxically keep you from receiving the experiences that are now being delivered, there are a few subtle techniques. While this is covered in many spiritual practices, simply letting go of the need or even desire for the outcome can be aided by the same mandala and/or blowing and burning process as in the first step, but adding all that you think is important and identify or dis-identify with as a twist. Shadow work is helpful, where you simply acknowledge and embrace even that which you judge as bad within yourself. Eagle is a great symbol to help with this, as it helps you to attain the broadest perspective, and simply having a picture of an eagle around helps. It is no wonder that was chosen as the Mythic symbol for the United States. An example of the final step in achieving your ideal life experiences or goals, also known as dreaming your world into being, is what we call the Destiny Altar. Much like the vision board, you can bring together symbols that represent and elicit the ultimate feeling place or experience you desire. In many cases, even placing your own image there to put you in the scene is helpful (even if it feels somewhat uncomfortable to do that). This can also be done in the form of a mandala, but will be more permanent, and something you can add to and tend to from time to time. You can feed or bring gifts to this altar as well. Remember that this is not the kind of altar where you worship; instead it is just there to anchor your goals in the Mythic layer of your being and to strengthen your signal. I don’t think anyone can say definitively how or why going through these ritual motions works better than only visualizing or the several forms of prayer, manifesting, psychological techniques. I have my own theories and observations about it related to engaging the whole being, and helping to focus your intent. And, I also see that it is best to do both, and to get out there and do stuff of course as well! The Universe does seem to require that you take one step forward in order for it to take a hundred steps toward you. So, in addition to all that you already do, play with the above techniques and see what kind of results you get. And when I say play, I really mean play, because the lighter, easier, and more childlike you approach this, the better it seems to work. ← The Most Important Question for the Current Shift – What is influencing you?